Tooth decay is one of the world's most prevalent diseases — and one of the most preventable. We've known the primary prevention recipe for decades: brushing and flossing daily, and dental cleanings and checkups at least twice a year. But consistent oral hygiene isn't enough — you should also pay attention to your overall health, diet and lifestyle habits. Each of these areas in their own way can contribute to abnormally high mouth acid, which can soften enamel and open the door to tooth decay. Lower saliva production is one such problem that can arise due to issues with your health. Among its many properties, saliva neutralizes acid and helps maintain the mouth's optimum neutral pH level. But some health conditions or medications can reduce saliva flow: less saliva means less neutralization and chronic acidity. You can also inhibit saliva flow with one particular lifestyle habit — smoking. Tobacco smoke can damage salivary glands. Nicotine, tobacco's active ingredient, constricts blood vessels, leading to fewer antibodies delivered by the blood stream to mouth tissues to fight disease. A diet heavy on acidic foods and beverages can also increase mouth acidity. It's not only what you're eating or drinking — it's also how often. If you're constantly snacking or sipping on something acidic, saliva doesn't have a chance to complete the neutralizing process. In addition to your daily oral hygiene practice, you should also make changes in these other areas to further lower your risk of tooth decay. If you're taking medications that cause dry mouth, see if your doctor can prescribe a different one or try using products that stimulate saliva. Quit smoking, of course, as much for your mouth as for the rest of your health. On the dietary front, reduce your intake of acidic foods and beverages, especially sodas, energy or sports drinks. If you've counted on the latter for hydration, switch to water instead. And limit acidic foods to mealtime rather than throughout the day. It's all about maintaining a healthy pH level in your mouth. Doing so along with good oral hygiene will help you better avoid destructive tooth decay. Although not high on the glamour scale, saliva is nonetheless an important ingredient in a healthy life. This "multi-tasker" fluid helps break down your food for better digestion and supplies antibodies to thwart threatening microorganisms coming in through the mouth. But perhaps its most important role is to neutralize mouth acid that can erode tooth enamel. Without this buffering action, you're at much greater risk for tooth decay and possible tooth loss. That's why chronic dry mouth is much more than just an unpleasant feeling. 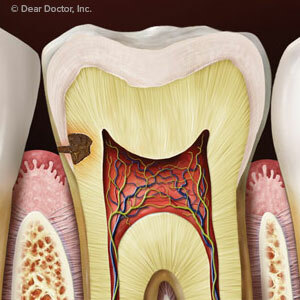 If you're not producing enough saliva, your risk for developing tooth decay (and periodontal disease too) skyrocket. Here are 3 things you can do to avoid dry mouth and promote healthier saliva flow. Watch what goes in your mouth. Some foods, beverages and other substances can interfere with saliva production. Caffeine in coffee, sodas and other beverages can cause your body to lose water needed to produce adequate saliva. So can alcohol, which can also further irritate dry tissues. And any type of tobacco use can decrease saliva production and heighten the dry mouth effect, another good reason to kick the habit. Drink more water. Water is the main ingredient in saliva, so keeping yourself hydrated throughout the day helps ensure a ready supply. 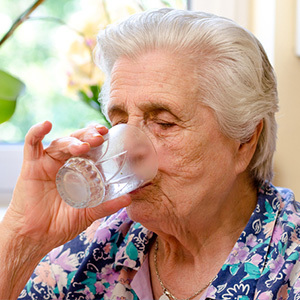 Drinking water also helps dilute acid concentrations and washes away leftover food particles that could become a food source for oral bacteria, the main source for mouth acid. Ask questions about your medications. Many medications can trigger chronic dry mouth including drugs to treat cancer, high blood pressure, depression or allergies. If you have chronic dry mouth, talk with your physician about the medications you're taking and ask if there are any alternatives that have less of an effect. If not, drink more water, especially while taking oral medication. You can also reduce dry mouth symptoms by using a humidifier while you sleep or using products that boost saliva production. And be sure you're brushing and flossing daily to further reduce your risk of dental disease. Managing dry mouth won't just make your mouth feel better—it will help your teeth and gums stay healthier too. If you would like more information on avoiding dry mouth, please contact us or schedule an appointment for a consultation.